But the fact that Big Mouth is animated really is a reason not to watch for some people. Animation doesn’t get the benefit of the doubt like live-action television does. People either assume it’s for children or for grown men who still live in their mother’s basement. But animation allows artists to create stories that may not otherwise work. Big Mouth, after all, is about a bunch of middle schoolers getting boners. You can’t exactly make a live-action version of that, can you? But Big Mouth isn’t the only example here. Avatar: The Last Airbender is a show for children, but has themes of love, loss, anger, compassion, and responsibility, among others, that adults may be able to relate to even more strongly than kids. When I pitched this idea to the other Hypable staff members, I got a flurry of suggestions for animated shows, new and old, that don’t get the mainstream appeal they deserve. This is a list of more recent animated series you should check out if you’re looking to delve into a new show — or are looking to watch more animation in general. And don’t worry — there’s a little something for everyone. 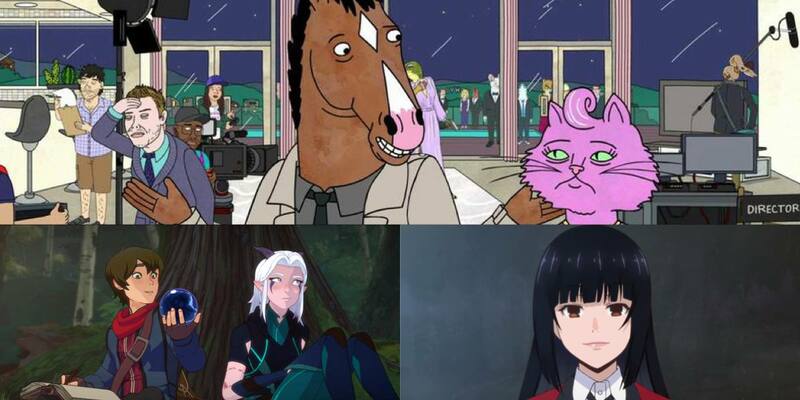 Here now are the best animated shows. No, I’m not tired of talking about Big Mouth yet. And considering it was the inspiration for this article, I might as well kick off our list with one of the best and most daring animated shows I’ve ever watched. The series circles around a group of friends in middle school as they deal with going through puberty. Fair warning, though: This series doesn’t pull any punches, so if you’re a bit reserved, it might not be for you. That being said, it’s absolutely brilliant in the way it tackles the hardships of life. It’s not just about puberty, but deals with divorce, depression, consent, body image, and a whole host of other issues that kids and adults alike can relate to. This show literally could not be anything other than animated, but that in no way detracts from the message, which is that we shouldn’t be ashamed of our sexuality and that everyone goes through an awkward period at some point in their life. Not only is it extremely relatable, but it’s important. Imagine skipping out on a show that educates while it entertains for the sole reason that it’s animated. Avatar: The Last Airbender is, at its core, a hero’s journey fantasy epic featuring a nature-driven magical power called bending — some humans are able to harness one of the four elements (earth, fire, air and water) and shape it to their will, and the center of spirituality in this universe is the Avatar, a single person who can wield all four elements. The mantle of the Avatar is passed down through reincarnation — when one dies, the Avatar spirit is reborn in someone else, so the Avatar also has a connection to the spirit world and to Avatars of the past. We join the story with Aang, the 11-year-old Avatar, born to Airbenders and frozen in ice for 100 years. When he’s recovered by two Water Tribe siblings, he discovers a very changed world, and sets out on a journey to master all four elements and restore balance. In this scenario, animation is the perfect medium: it serves to enhance the storytelling by portraying everything about Aang’s world as equally realistic and equally possible — showing the beauty of the bending power, the weird combined creatures and even some of the landscapes would have just not been well achieved on camera or with special effects, especially at the time the series was made in 2005. The consistency of the visuals help immerse the viewer into the magical possibilities of Avatar: The Last Airbender — it makes the universe feel much realer than a live action interpretation would, one of the movie adaptation’s many flaws. Avatar actually is getting a new live-action series re-make. It’s helmed by the cartoon’s creators, it has a Netflix budget and 2018 VFX technology at its fingertips, so we’re going to trust it, but do yourself a favor and watch the animation first. Shows like Avatar: The Last Airbender come along once in a lifetime. Initially aimed at kids viewers — it aired on Nickelodeon — it’s truly the most perfect story for all ages. It’s ageless, timeless, an instant classic. Younger children may not understand the true depths of the show’s significance, the subversiveness and sharpness of its writing, but they’ll take away incredible life lessons — Avatar is deeply educational about what being a good person looks like without being in your face preachy about it — and adults will fully grasp the value of the diversity, the cleverness of the humor and the quality of the character arcs across the board over its three seasons. It is the best-written, best-plotted, least harmful, most enriching show I have ever personally seen, and it is not an exaggeration to state that Avatar: The Last Airbender is the most universally acclaimed property, regardless of genre or medium, that I’ve ever engaged with in all my years of fandom. Everyone who’s seen this show is forever obsessed with it. Beauty is in the details. And for BoJack Horseman, Netflix’s series about a sitcom actor struggling with irrelevance and addiction in his later years, that saying could not be more accurate. The show is a gritty exploration of depression, drug-abuse, fame, and the entertainment industry. The animation, writing, and attention to detail is so carefully constructed that for nearly the entire series you don’t give the blending of animals and humans in the world a second thought. Everything just works. Over the last five seasons, viewers have watched BoJack (former star of Horsin’ Around) navigate the fallout of his choices, but they’ve grown to love the friends and chosen family of show’s namesake. The ridiculousness of Todd’s creations versus the grounded discussions of his sexuality, the workaholic manager Princess Carolyn and her journey to find love and a family, and the slow unraveling of Diane’s ideals, all make up a small portion of this ensemble show. It’s rewarding in one sitting, hard to swallow on the second viewing, and shows its true genius the third time around when you catch every small choice drawn into the animation. It’s one of the best examples of a show that blurs the line between comedy and tragedy in the current pool of prestige dramas. I’ve never needed to press play so quickly as I did when I accidentally bingewatched the Netflix anime Kakegurui. The show focuses on a private high school academy where the students gamble for much more than money. In one episode, for instance, a character battled our protagonist in a game of matching cards to try and win her fingernails. Fingernails. The beauty of Kakegurui is that it doesn’t fall into the same gory traps of other similar animes. Instead, the violence in this show is somehow tasteful, in that it never feels gratuitous. There is always a purpose, a motive, an endgame to every single line and action. The stakes on the show are only half of the fun. While the plotting is on parr, the animation is beyond. The character models are gorgeous, with almost every main character have defining physical traits that are both fun and over-the-top. The facial animations are unlike anything I’ve ever seen in any other anime, both in their detail and uniqueness. I’ve done some digging around to find another show like Kakegurui, but haven’t come across anything that seems even remotely close. Starting this show will make you crave more, something that doesn’t go away on your second (or third, or fourth, or fifth) rewatch of the excellent 2017 first season. I’d bet that the eventual second season of Kakeguri will be just as delectable as the first. It will come as no surprise to anyone passingly familiar with me that I would nominate Voltron to this list. A reboot of Defender of the Universe, and helmed by Avatar-alums Joaquim Dos Santos and Lauren Montgomery, the show follows the five Paladins of Voltron and their allies, as they seek to free the universe from the rule of the Galra. Taking its source material and elevating it to new heights, Voltron introduced a compelling story and characters, with complex relationships, and surprising twists and turns that always feel incredibly earned within the scope of the show. And its latest season, the seventh, was perhaps its most ambitious yet. It took some daring risks — including two episodes that did not focus on the central characters we’ve come to know and love — and, in my opinion, they paid off in a big way. And all of that is without even touching upon the animation. From stunning worlds, to dynamic battles, to emotional beats that speak a thousand words, there is so much to dive into with just the visuals alone that Voltron’s incredibly active fandom pour hours over scenes in an attempt to glean where the show might go next. But, perhaps, the jewel in Voltron’s crown is Takashi ‘Shiro’ Shirogane. I’ve spoken at length about just how much Shiro means to me, but what’s one more time for good measure? Shiro is an incredible leader, who thrives no matter how difficult his invisible illness makes it. He faces several hardships, and succeeds, over and over again. Oh, and he’s queer. What Voltron has achieved in telling Shiro’s story alone is nothing short of extraordinary — but he is by no means the only character who will resonate with audiences. Trust me when I say, you’ll will fall in love, and connect deeply, with so many of them. Voltron will conclude with its eighth and final season in December, but it will — and should — live on far, far beyond its end. Though Netflix’s The Dragon Prince is new to the entertainment scene, the series has already made a considerable splash among fans seeking both fun and sophistication in their fantasy. Coming from the minds of Avatar: The Last Airbender veterans Aaron Ehasz and Giancarlo Volpe, as well as Uncharted director Justin Richmond, The Dragon Prince has considerable creative pedigree — and it shows. The complex series focuses on Callum and Ezran, two human princes whose lives are upended when (justifiably) vengeful elves crash into their home, intent on assassinating their father. A miraculous discovery soon sends them on a journey with Rayla, one of those very same assassins, and together the trio set out to restore peace in their conflict-torn continent. The Dragon Prince is a blend of elements, each one designed to appeal to an appreciably wide audience. The show weaves humor and heart through themes of loss, cyclical violence, moral and physical sacrifice, and personal challenge. It delights in the small joys of silly jokes and sibling bonds, while remaining comfortable with ambiguous characters — the high mage Lord Viren and chief Elven assassin Runaan stand out particularly among the nuanced cast. Though The Dragon Prince is digitally animated, the intricate and soulful character designs bring the warmth of its style to life. All together, it’s a beautiful little world brimming with stories and lives as yet untold. With The Dragon Prince season 2 set to be released next year, even animation-skeptics will want to hop on the bandwagon and come along for what promises to be a truly epic ride. It’s no coincidence that several of the other shows on this list cite Avatar: The Last Airbender as influential in some way — the team that cut their teeth on Avatar have carried that experience and those standards forward in their careers, going on to create new worlds and stories with the same sensitivity and raising the bar all around regarding the possibilities for important character drama and seriously serialized storytelling in children’s animation. But since ATLA’s conclusion in 2008, fans never stopped making noise about their beloved show, and showrunners Bryan Konietzko and Michael Dante DiMartino were given the opportunity to create Avatar: The Last Airbender’s rightful heir — quite literally. The Legend of Korra, which debuted in 2012, picks up the story 70 years later and follows the world’s next Avatar, a waterbender called Korra who we meet as a 17-year-old. Aware that its most passionate audience included a lot of adults, and that even those who were children when ATLA aired had grown some, Korra is aged up in tone, taking place over a number of coming-of-age years and following the lives of older teenagers and young adults. Korra is a different show for a different time, but the way it honors its legacy is very important. Unlike Aang, who entered his story entirely isolated, Korra has a huge support system, including significant members of Aang’s own family, because of course, for Korra to live, Aang has died. This reality haunts The Legend of Korra in the best and saddest way possible — if you loved ATLA, be prepared to have your heart ripped out every so often, or be transported in fits of delight, as the fate of your old favorites enter Korra’s story in one way or another. But Korra also stands alone — ATLA is not strictly necessary prior viewing. It’s got a different sort of heart. The challenges Korra faces are very different to those of Aang — there’s a lot about celebrity, a lot about politics, a lot about romance, a lot about trauma, and a ton about expectations and ghosts of the past — and the setting is urban: the development in society since Aang’s days, when the world was very pastoral, has reached a sort of steampunk 1920s level, including cars, radios and plenty of corporate industry. Korra’s identity, personality and driving forces are nothing like Aang’s, and what’s required from her role as the Avatar is also very different. The Legend of Korra is a really unique achievement in the way it both feels like a brand new show and yet entirely and realistically in line with the development of Aang’s world and the memory of his family. And if you heard through the grapevine that it’s gay? Yup. You won’t be disappointed. What are some of the best animated shows you’ve ever watched?